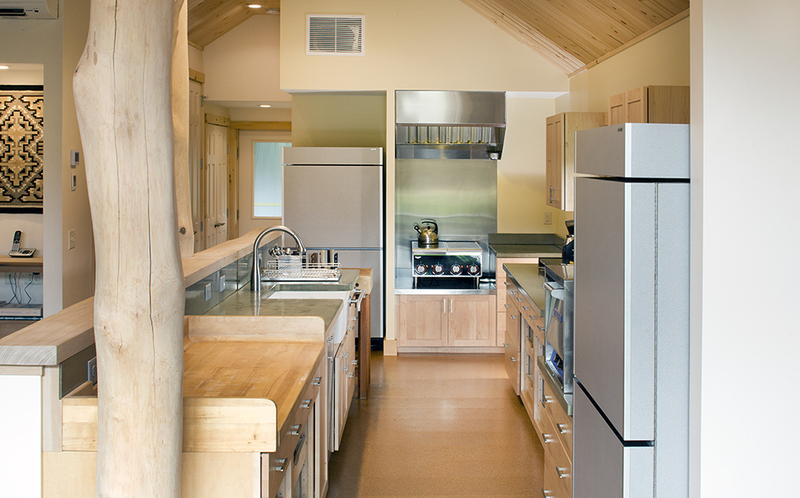 Our clients are an industrious woodworker and a weaver in their retirement who wanted to create the most accessible studio space possible. The budget was modest, but it was decided that a resilient, low-maintenance building would bring the best return on their investment. The end result was a small farmstead-like gathering of buildings around a stone courtyard, all in a constructed rolling landscape. The site was chosen for its proximity to a well maintained road and local amenities. Unfortunately, the road made traffic noise a concern and C&H needed to balance distance to the road on the east side from an established and potentially shadowing tree line on the west. We used 3D modelling and a solar pathfinder tool to locate the building with acceptable solar access, then developed a landscape design that moved earth to create a pond depression to the North and a sound-screening earth berm against the building to the East to diminish, if not eliminate, the traffic noise. 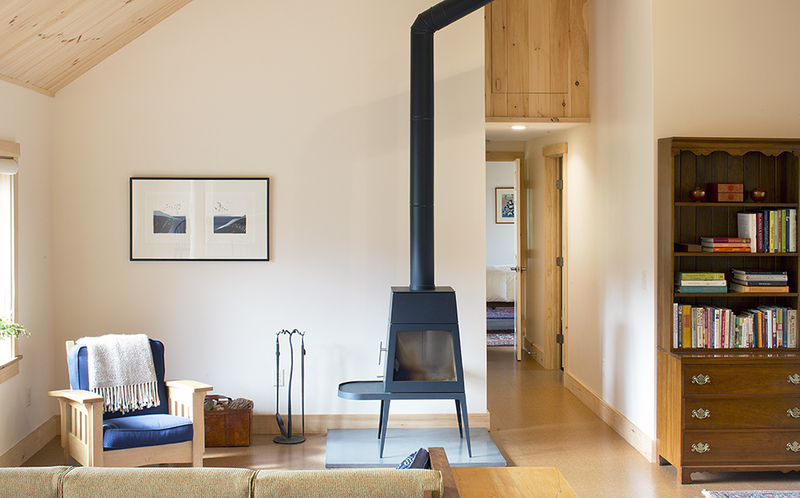 We explored two solution concepts for the studio spaces, each of which amounted to more space than that of the house itself: 1) an on-grade “barn”-like structure of lower performance quality and finish than the house, or 2) a basement below the main living space. 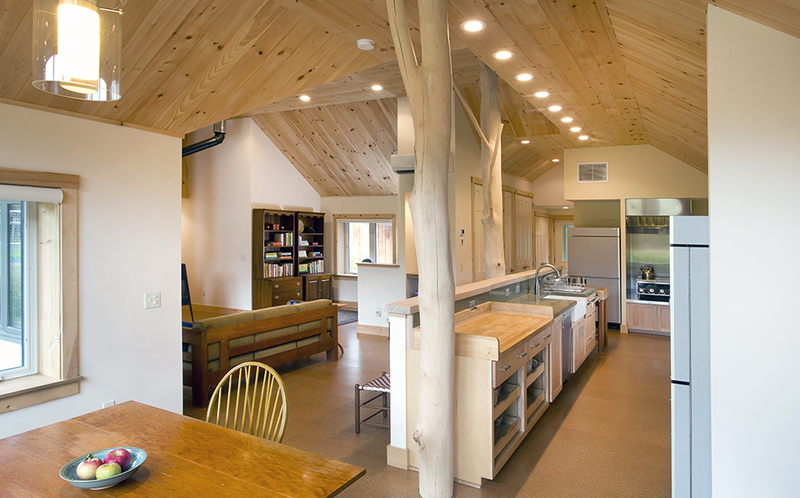 Our clients preferred the barn route, so we ratcheted down the cost premium by supporting our client in procuring and installing a pair of proprietary “pole barns” – one for a garage and one for the barn studio. The latter would be fitted out as part of the main house contract. This entailed only a modest construction cost premium and had great benefits from a convenience and experience standpoint. 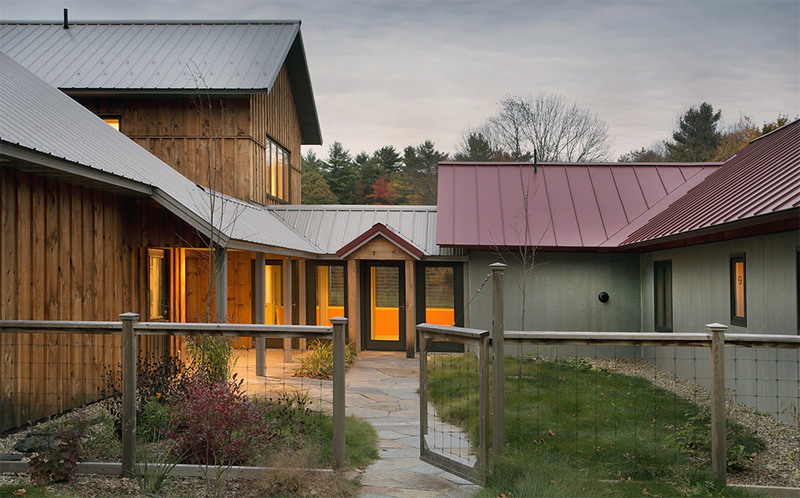 In pursuit of durability, we specified a standing seam metal roof and a wall system that uses precast concrete foundation panels above grade as the exterior wall for the main house. The precast concrete foundation panels, beyond durability and essentially zero maintenance, had the added advantages of providing a more solid sound barrier, and enabling earth berming directly to a portion of the eastern wall. This precast material has a broomed concrete finish, which will accept colored acid etching stains, as well as being highly tolerant of vegetation growing on its surface. Consistent with an emerging pattern in our residential work, there are two splendid trees, retaining some of the natural branching form, that were harvested to perform the two major structural support functions. 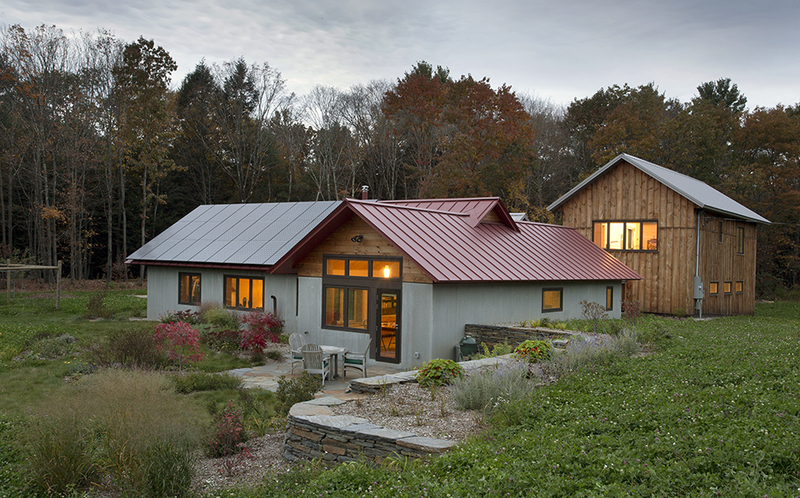 The roof supports a 9.6 kW photovoltaic array to supply electricity to the home and studios.